I am a big fan of all things nails - you might have guessed by now! So naturally any new development, whether it be shatter or magnetic effects to matte nail polish, takes my interest. 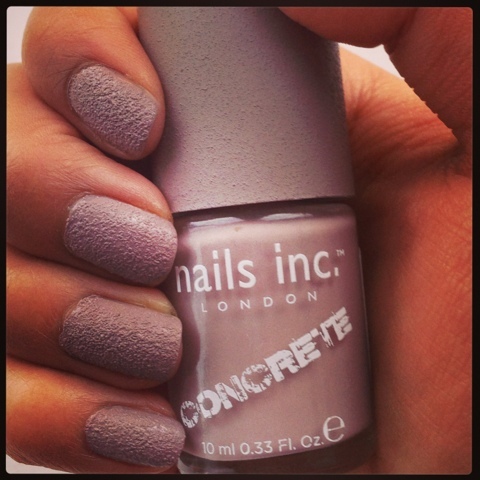 Nails Inc Concrete nail polish dries to a texture matte finish, I chose the colour London Wall which is a mixture between a taupey/brown and grey - I hope that makes sense. It was very easy to apply and dried quickly, just as well seeing as I applied just a short while before I went to sleep. I'm not sure how easy this will be to remove, as it is 'textured' I think I will need extra remover and cotton wool. Hopefully, it won't be as difficult as glitter nail polishes. Have you tried this or anything similar? Let me know, I would love to hear about other people's experiences with this or similar products from other brands. Send me a picture!